Mail send to Prime Minister and Department of Atomic Energy and other relevant department and officials from our association is given below. Sub : Request to take Criminal as well as departmental action against Mr.
India as well as Department of Atomic Energy – reg. 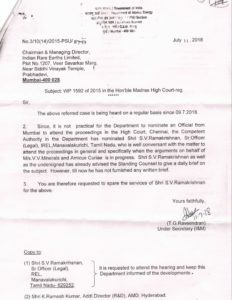 When the above facts were brought to the notice of the Honourable High court, Victor Rajamanikkam filed apology affidavit and since the PIL already admitted, it converted as Suo-Moto PIL. 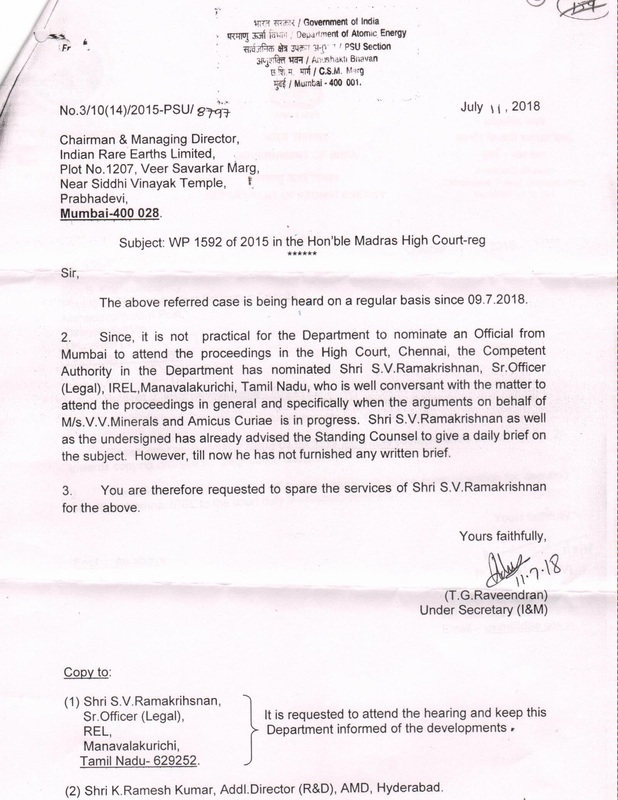 The amicus Mr. Suresh who has long enmity with VV Mineral and who has already appeared on behalf of Mr.Dhayadevadas henchmen V.Sudaram was unfortunately appointed as amicus. So the amicus is arguing against government as well as VV Mineral. Meantime, some people from Atomic Minerals Directorate (AMD), Hyderabad and from Indian Rare Earths Limited (IRE Ltd), particularly Mr. Ramakrishnan, Legal, Manavalakurichi want to use this situation to revenge VV Mineral and other companies as they were already made complaint against them. So they also giving advise and points to Mr.Suresh to use the same against Union of India as well as Atomic Energy Department, Ministry of Mines and also VV Mineral. 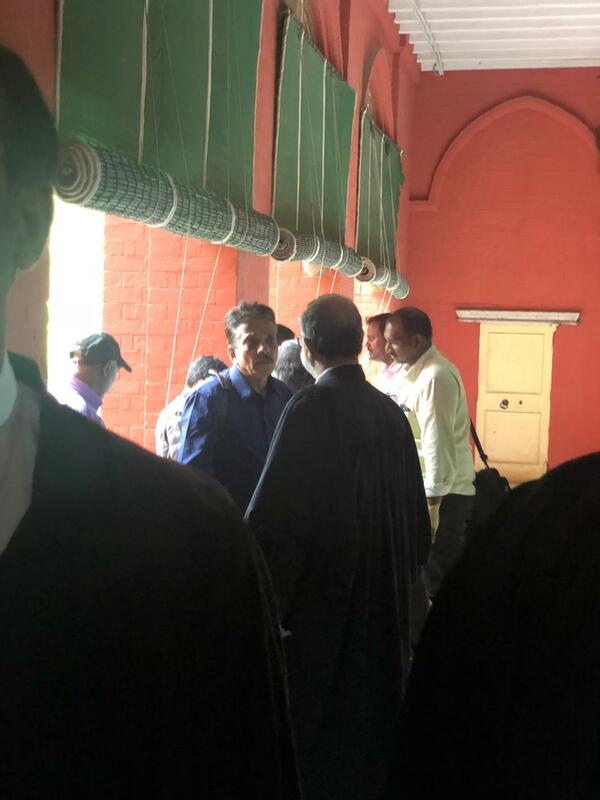 When Department of Atomic Energy deputed Mr. Ramakrishnan, Legal to attend the hearing, instead of attend and assist the standing counsel, Ramakrishnan advised and helped to the Amicus. Thus he has weaken the government side. 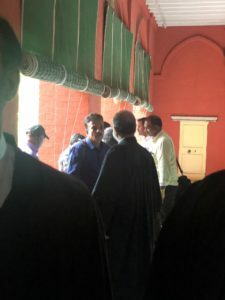 But instead of assisting Standing Counsel, Mr. Ramakrishnan colluded with Amicus Curie and advise him to argue against not only private players, but also against government, particularly Department of Atomic Energy (DAE). I am attaching herewith the photo showing Mr.Ramakrishnan is sitting with Amicus Curie and advising to argue against Central Government as well as Department of Atomic Energy. This is against the Government Servant Conduct Rules and IREL Service Manual. I therefore request you sir that, he may be immediately suspended and Criminal as well as Departmental action may kindly be initiated against him. We hereby humbly request the Honourable Prime Minister, to refer this matter to CBI to investigate why instead of the deputing the officers from the nearest location of Hyderabad which is 626 Km from Chennai, why one company representative from Manavalakurichi which is 719 Km away from Chennai was advised to attend the case, that too, without any specific order from the Honourable High Court or specific request from the Standing Counsel. 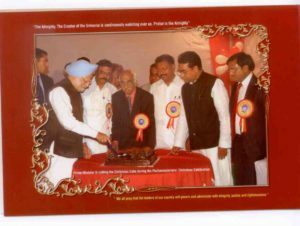 The Honourable Prime Minister may also direct the CBI to investigate all over India, in how many writ petitions and PILs , Department of Atomic Energy is shown as respondents and for how many cases, IREL deputed the company representative to attend the case. If such enquiry is conducted, we will establish the nexus between Dhyadevadas and Ramakrishnan and some corrupted officials, who has got key postings from your government. Our request to IREL CMD is, if you forward the same to your vigilance officer, since he has got a share from Ramakrishnan, no action will be taken. Instead, you please constitute an enquiry committee and inform the date of enquiry to us, so that, we will attend with evidence, video and witnesses to establish our complaint. Because of this corrupted persons partial action, our Indian nation loose export earnings worth more than Rs.2000 Crores per year which is also one of the reason for the weaken of the rupee. Hence this complaint it forwarded to CVC, V&AC and other departments also. IREL’s Chairman and DAE, Joint Secretary’s early action and reply will be highly appreciated.